Go forest bathing without a swimsuit. It's good for your mind and body. What image does the term ‘forest bathing’ bring to mind? A steaming hot spring set deep within the trees? Turns out, it couldn’t be further from the truth. Shinrin-yoku is a Japanese concept which has become known around the world as forest bathing. It was developed in Japan in the 1980s as a form of preventative medicine, a sort of tonic for the mind and pathway to wellbeing, grounded in the idea that spending quality time in nature is simply good for the soul. It most certainly has nothing to do with hot springs and you definitely don’t wear a swimsuit when you experience forest bathing. 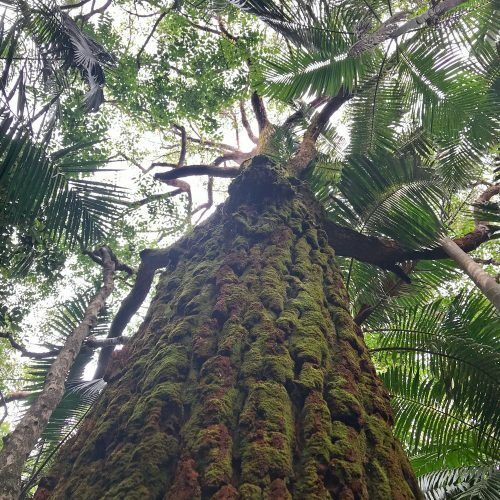 Unlike hikes or bushwalks, forest bathing has no particular destination in mind. Distances are small and the pace is much slower. In fact, forest bathing is all about slowing down, consciously breathing and making deeper connections with the natural surroundings, which in turn is said to cultivate mindfulness and promote healing. According to WildFest, in Germany, it is known as “Waldtherapie”, in Japan it is called “Shinrin-yoku” (森林浴), in Korea it is referred to as “Sanlimyok (산림욕)” and in China and Taiwan people call it “Sēnlín liáofǎ (森林療法)”. 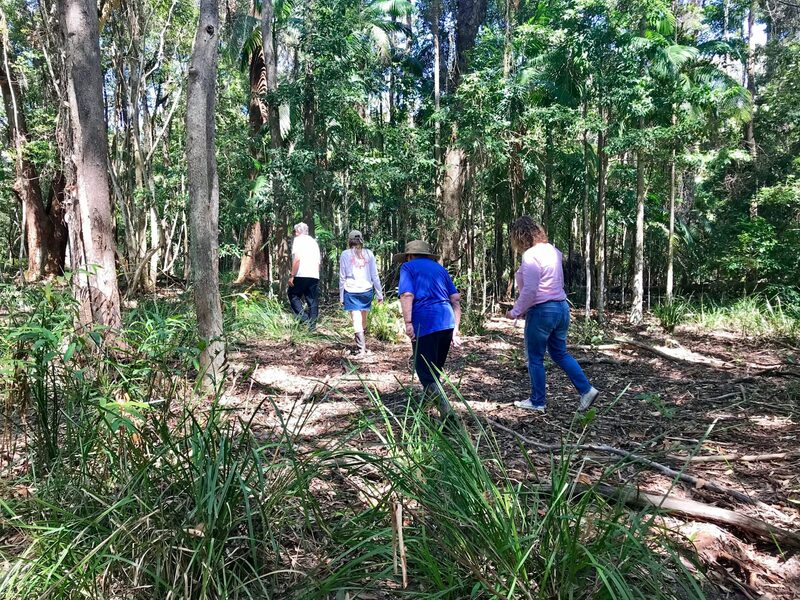 Here in Australia the practice is known as forest bathing, shinrin yoku, or forest or nature therapy. How do you bathe in a forest? The worldwide movement that is known as forest bathing is more than taking a walk in the park. The experience has a clear structure and is led by a forest bathing guide who has undertaken training to become qualified. 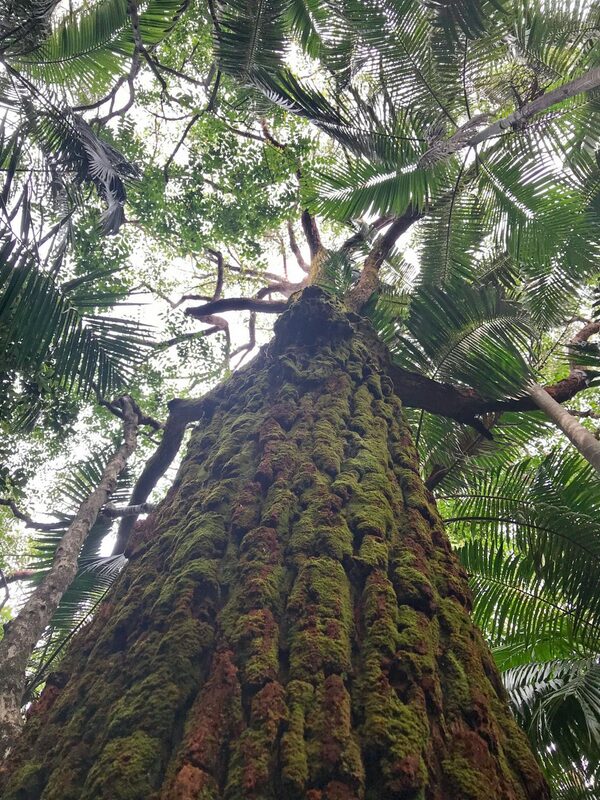 There are more than 1500 accredited forest bathing guides around the world, including a handful in Australia. The Association of Nature and Forest Therapy, one of the biggest providers of training, offers intensive week-long courses in some spectacular locations around the world, supported further by a six month practicum which you complete from home. There are many other training providers, and like yoga teacher training, I expect that a good deal of research would be advised before committing to a course. 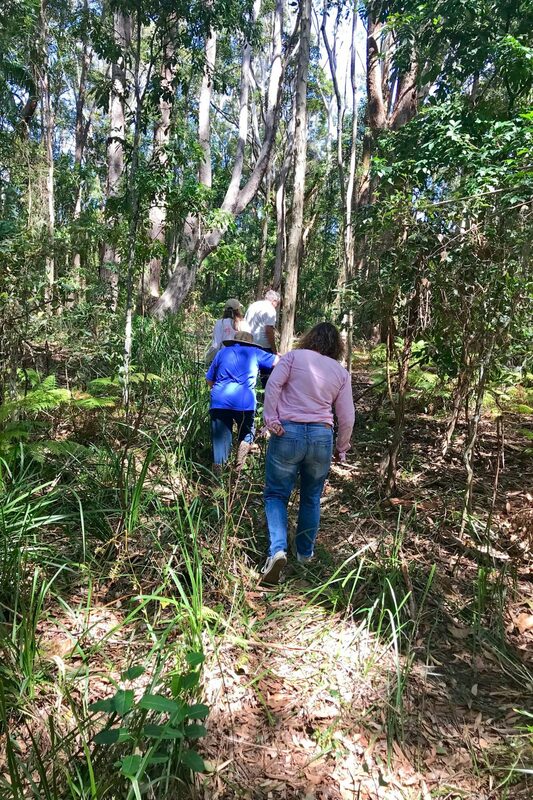 A typical two and half hour guided forest bathing walk progresses through a series of “invitations” beginning with leaving your past or future concerns behind, and then moving through a sequence of experiences which encourage you to connect with nature, cultivate mindfulness and simply relax. 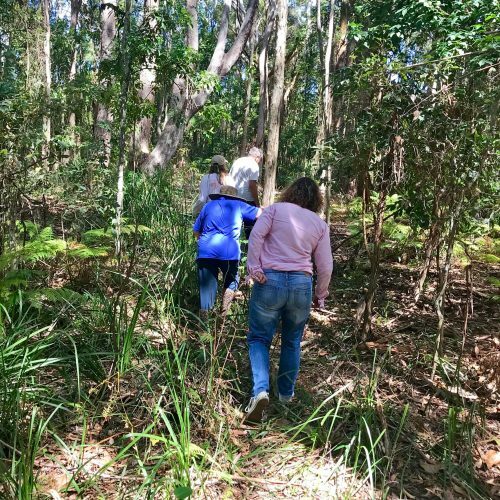 As a small group activity, forest bathing may also draw benefits from being a shared experience. The Association of Nature and Forest Therapy says that in Japan, the widespread phenomenon of “death by overwork”(or karoshi) required a serious response. Inspired by the Shinto reverence for nature, government-backed research focused on the measurable health benefits of a stroll in the forest. A formal therapy was developed from the research and named Shinrin-Yoku, or forest bathing. 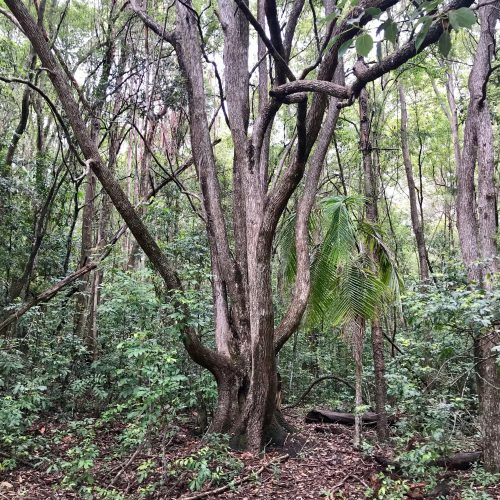 Forest bathing websites describe the practice as having an evidence-based framework to support treatment of a variety of modern health afflictions. 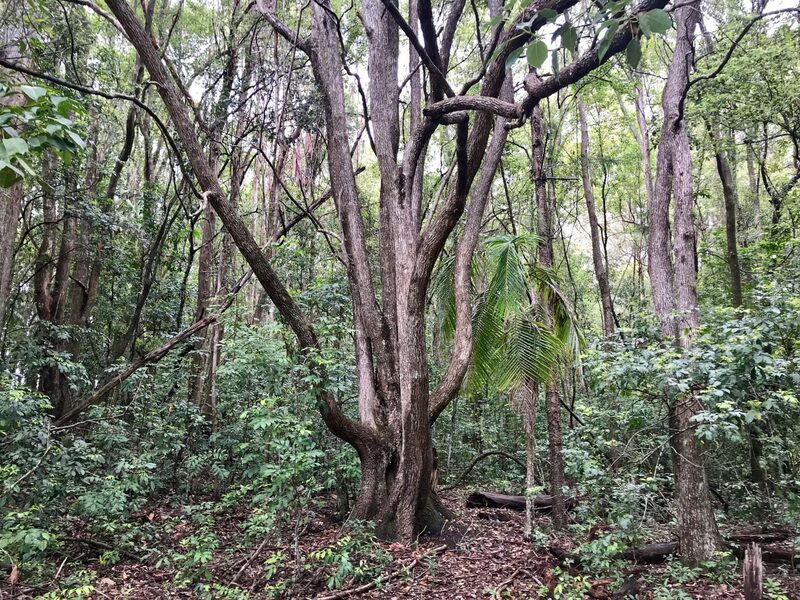 According to this great article from the ABC Life website, forest bathing has been shown to significantly reduce blood pressure and stress levels, as well as have cardiac and pulmonary benefits. 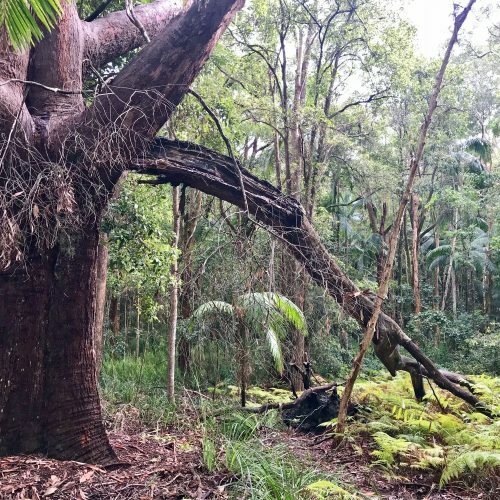 If you’re after an Australian perspective on how forest bathing has been incorporated into wellness and mindfulness programs, this article is it. We haven’t been trained in forest bathing. And most likely, neither have you. But one of the things that draws us to The Lily Pad is the sense of calm and rejuvenation that envelops us as we sink into the sea of green that surrounds the property. It’s like a green smoothie for your soul, sipped through your eyes. 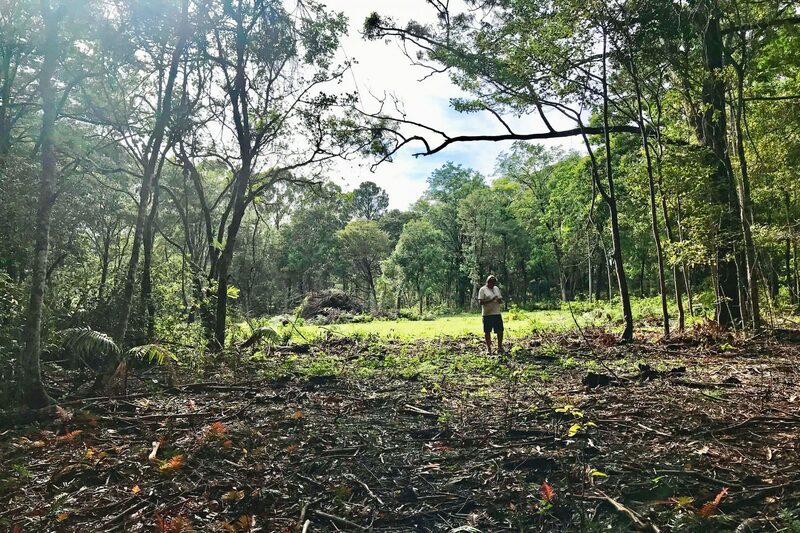 We have created a series of meandering pathways and edible gardens on the edge of our 50 acre property, a wild sub-tropical forest with high conservation values. With protected koala habitat, The Lily Pad is home to a host of animals and birds that can be seen and sometimes only heard when you stay. 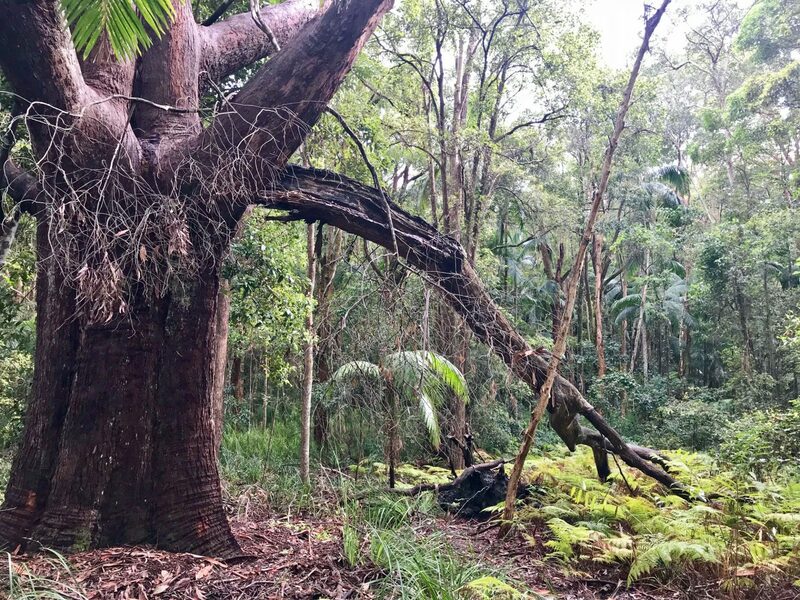 A recent program of bush regeneration under supervision of ecologists, is helping restore balance to our ecosystem. Guests are encouraged to slip on some walking shoes, apply some sunscreen and insect repellent, don a hat and head off for a slow wander around the gardens. Be sure to stick to marked paths around The Lily Pad at all times. Give yourself time, at least an hour, and try it at different times of the day. Look up, look around and listen. Breathe. Step 1 – DISCONNECT. Leave your phone and camera behind, so that you can be fully present in the experience. Step 2 – NO EXPECTATIONS. Set aside your goals and expectations. Wander without a pre-defined destination in mind, allowing your body to take you wherever it wants. Step 3 – GO SLOW. Pause here and there. As they say, stop and smell the roses. Look more closely at a leaf or notice the sensation of the path beneath your feet. Step 4 – OBSERVE & FEEL. Find a spot to take a seat and listen to the sounds around you. See how the behaviour of the birds and other animals changes when they become used to your presence. Step 5 – TALK LATER. If you go with others, make an agreement to resist talking until the end of the walk. Gather around the fire-pit or on the deck of The Lily Pad to share your experiences at the end. You might like to check out these books on the subject: Your Guide to Forest Bathing by M. Amos Clifford; Forest Bathing and The Art and Science of Forest-Bathing by Dr. Ling Qi; and Shinrin-Yoku: The Japanese Art of Forest Bathing by Yoshifumi Miyazaki. By the way, who knew the ABC had a website called ABC Life, devoted to all things health, wellbeing, travel & food, plus more? Check it out, there’s a load of great articles you might be interested to read.